The new version of the Builders Exchange Online Planroom is here — IPIN 10.0! Our years of industry experience combined with your feedback has guided us in this redesign of our online planroom. The new online planroom maintains the ease of use and efficiency of information you are used to and combines it with a new cutting edge design. Everything you loved about our classic site is still available along with a host of new features and improved accessibility. IPIN 10.0 works perfectly on all major browsers (Chrome, Firefox, Safari, Internet Explorer). The site will also automatically detect and adjust to all devices of all sizes, including all mobile devices. The top navigation bar remains consistent throughout the site. 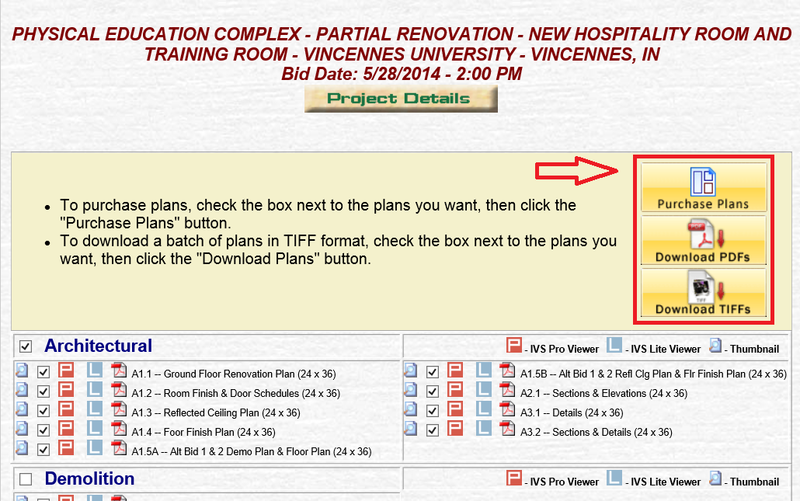 Project lists have been broken into phases – Planning (previously prebid), Bidding (previously Active), and Postbid. On a mobile device, the menu collapses to the ubiquitous mobile icon and menu. We have redesigned My Deskpad to be the core of your online planroom. All pertinent information can be found here, and it is intended to be the launch point for most project interaction. The first section, My Reminders, provides a quick view into the most pressing information – your tracked projects bidding today and tomorrow. There is also the ability for you to add your own reminder to this screen (and the bid calendar). Your reminders will appear on this list as well as the bid calendar to the right. Below that is the My Nightly Emails section. Clicking on any section will expand the list of projects contained therein. Click on the “Today” button to see your most recent filter results or click on “Last 5 Days” to toggle the last five days of filter results. New Filter Results list your new filter hits, broken down by filter, then date (from your nightly email) and how many of those projects you have not yet viewed (unseen). Tracked Project Changes show any major project changes to projects you are tracking and how many of those changes you have not viewed (unseen). My Tracked Projects shows a list of every project you are currently tracking, regardless of the phase of the project. The next four sections under New Project Activity Since deal with new projects or information entered in each phase (Bidding, Apparent Lows, Contract Awards, and Planning) with the option to toggle between information added since your Last Login, the Last 24 hours, the Last 48 hours, and a Custom option that will let you set your own time frame. Finally, the last section is My Private Projects, which lists any New Private Projects you’ve been invited to over the last four days, any Private Projects that you have been invited to view which bid in the next seven days, and then any New Private Project Messages or Invitations to Bid (ITBs) you have received in the last seven days. Next, Quick Search allows you to find projects via project name, project ID number, project scope keywords, or your personal notes in the Planning, Bidding, or Postbid phases. Finally, the Private Planroom Plus logo links to the login page for your Private Planroom. All lists of projects on the site – viewing by phase from the main menu, search results, or filters – are formatted identically. The left-hand side on most pages contains an “Actions Icons” menu bar. This menu bar adapts per page and provides actions that can be preformed on the item you are viewing. In the case of project lists, you can Search the List (first button), Print the List (second button), or Toggle a Grid or Detailed View of the list of projects (third button). A tool-tip will explain each function on each page as you move your mouse cursor over these buttons. Project Detail Pages maintain a consistent interface throughout. A top tab bar provides click access to Details, Bidders, Plans, Specs, Addenda, and Personal Notes. The left action bar again provides page specific functions. The center area contains the main page content. The right area provides a quick reference area or drill-down section (to be explained in detail on each page). The middle section includes basic project information, document info/status, and owner design team. If there is a pre-bid meeting, that info will be visible in the red box beneath Your Notes, with all info and the ability to add reminders to your Outlook or Google calendars (seen below). The right section list what we call the Project Vitals. Below that is the project address (if provided) including a map and the approximate distance from your company’s location. Next is the the Visitor Count/Project Rank for the project based on site viewing statistics. The central section contains the bidders, broken down by company type. Members are indicated with the ‘M’ icon. Clicking on the company name will provide a page overlay with company info and stats (covered in Research section). The right column provides a quick view of what trades are bidding. Clicking on the trade will jump directly to that section. 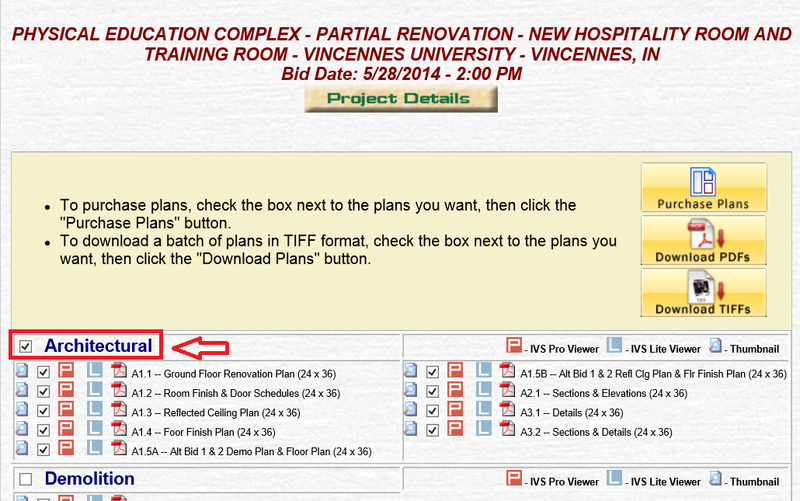 The viewer options lets you select which Viewer/Document options are visible on the plan list. For instance, if you only use the (NEW FEATURE) Toolbox Plan Viewer and download PDFs, you can choose to only see those options. However, if you select a viewer option that is not compatible with the device you are using (i.e. 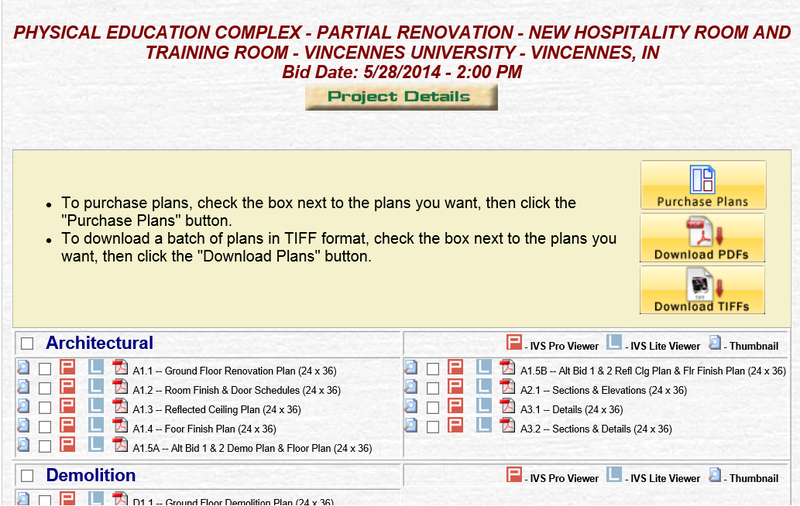 – Pro Viewer on an iPhone), that option will not show on the plan list. If you move to a compatible device, the option will reappear. As mentioned earlier, there is a new viewer called Toolbox (see pic below) that is completely browser based and requires no installation. It can be used in any current browser or operating system (Microsoft Windows, Apple MacOS, Android, iOS, etc). At present, it provides functionality equivalent to the current IVS Lite Viewer. Full markups and takeoff tools will be added later. Printing is handled via PDF – we will simply provide a PDF file of the view or document. You can also toggle the list of Specs while you use the Toolbox viewer to be able to view plans and specs at the same time much faster. The action bar provides the ability to download the selected spec sections either in a ZIP file of individual PDFs or as a single combined PDF (NEW FEATURE) (NOTE: You may need to enable Pop-Ups on your browser for this feature to function as intended). The main section is simply the spec list, separated by division. The right side contains search options. The first section provides the results of running all of your saved SAM Search filter keywords against the project’s specs. If you reload the page, you can see it happen in real-time. Clicking on the hits next to each term will highlight all spec sections in which that term was found as well as scroll automatically to the first occurrence. Below that, you can run a per-project SAM search of your own to find and highlight any spec section which contains the keyword(s) you entered. Includes a list of all Addenda, Amendments, or Memos on the project. Click on the link to bring each up in PDF format or right-click and choose “Save As” to save the PDF to your computer. From the filter screen, you can create, edit, run, or delete a filter. Note: as of this writing, work is still being done on this section. Currently, you can run an existing filter and view the edit screen, but please do not add a new filters or attempt to save any existing filters. Please use the ‘classic’ site if you would like to save any new filters or edit current filters. While editing or creating a new filter, the main new feature is the inclusion of a national county map. Unlike previous versions, this map will work on any device (desktop or mobile). Several sections of the previous version of IPIN have been combined into Research Center – namely, statistical research and company search. When looking for company information and bidding history, you can search from this single interface: company name, personnel, or filter companies by type. Member companies appear first in search results. Clicking on a company name brings up the company detail/research page. Note: on the rest of the site, clicking on a company name brings up this same screen in page overlay mode. The top section of the results includes basic company info, a list of contacts, and whatever company types, designations, labor categories, and trade names they have. Below that is a breakdown of bidding history – first by the bidder type, then by the type of projects bid on. Finally, there is a breakdown by county/area. The map on the right is zoomable and indicates all project locations. If you’re a user with Administrative Access with your company, you can use Review Company Usage to view how often the staff in your company have logged in to the online planroom and how many projects they have viewed over any custom time frame you enter at the top. We would like to thank our friends at The Builders Exchange of Ohio for their hard work developing this fantastic new online planroom and listening to our staff and member feedback in its development. They have truly exceeded our every expectation. We hope our members enjoy working with this new site as much as we do. If you would like to learn more about our new online planroom, check out our website events calendar for training opportunities in our Louisville and Lexington offices. We also have online webinar training opportunities by request. Approximately 3,000 actively bidding projects are reported in the Builders Exchange online planroom annually covering an area of approximately 60,000 square miles in Kentucky and Southern Indiana and hundreds of cities, towns and counties. It’s easy to understand why many of our members might not be able to tell how far a project is located from them at first glance, which is why we’ve added a new feature to the IPIN system: Distance from You. In March, Builders Exchange of Kentucky offered online planroom users an opportunity to provide us with opinions and suggestions for improvement of our online planroom (also called IPIN system), and we listened. The survey asked respondents to rate their satisfaction with the Builders Exchange online planroom in five key categories as well as compare the online planroom to competing services in those same categories. Questions were also asked about the format and presentation of bid documents, open-ended suggestions for improvement, and identifying interest levels in mobile applications. Over 70% of applicable respondents are satisfied with their experience with the Builders Exchange online planroom in four out of five key categories (see below). The majority of respondents in the fifth category (Software provided for conducting online takeoffs and estimates) were “Neither Satisfied or Unsatisfied”. A majority of all applicable respondents judged the Builders Exchange online planroom favorably in all five key categories compared to competing services, with over 80% judging favorably in three out of the five categories. Timeliness of post-bid reporting and improved options for online takeoffs will be main areas of focus for Builders Exchange as we move forward with upcoming upgrades to the online planroom and continue evaluate our project reporting coverage. We are also pleased to report that the ability to batch select plans has already been addressed, and as a direct result of your feedback, members now have the ability to batch select entire divisions with one click of the mouse (see this IPIN Tip of the Month). While the majority of members feel that Builders Exchange offers the most user-friendly and easy to use tools in the industry, we remain committed to improving and expanding our products and services to enhance the value for our trusted members using the online planroom. Thanks again to all of those who took the time to take the survey and congratulations to Chris Revell with Mills Supply, who won the drawing for the free iPad Air!